Investigate the source of some inflammatory leaflets about Aurane Frernis. Talk to Domalen and receive a leaflet. Take the leaflet to Aurane Frernis. Talk to either Aurane or Galuro Belan about the Slander. You'll find Domalen on the Foreign Quarter Plaza handing out inflammatory leaflets claiming some nasty things about the alchemist Aurane Frernis, who has a store on the Lower Waistworks level. Take a leaflet and visit with Aurane who will say that it's merely slander, and will ask you to investigate the source of it. Speak with Domalen and claim that the leaflet contents are lies to get him to admit that he was asked by Galuro Belan to distribute them. Return to Frernis with this information for your 100 gold reward. 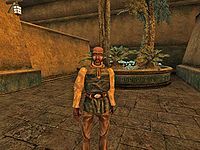 Alternatively, go and have a chat with Belan who owns an apothecary shop on the Waistworks level of Telvanni Canton. She should readily admit to being the source of the leaflets and offer you 100 gold to keep the entire matter a secret. You can collect the 100 gold 'bribe' from Belan and then expose her anyway to Frernis for another 100 gold. In order to get the Roland's Tear quest from Frernis, you must tell her the source of the leaflets. 10 While in Vivec, a man approached me and handed me a leaflet. He told me it contained important information about a local merchant. 20 I have spoken to Aurane Frernis, the apothecary mentioned in the leaflet I was given. She was furious about the slanderous comments it contained, and offered me a reward if I could find out who was behind the misinformation. 30 I spoke to Domalen, the Redguard man who was handing out the leaflets. He told me that he was hired by Galuro Belan, another apothecary in Vivec, to distribute the materials. 35 Domalen is dead. Although he told me the source of the leaflets, his crime was no less. 40 Domalen is dead. Frernis will not have to worry about him handing out more leaflets. 50 Galuro Belan was ashamed when I approached her with the information that she was spreading lies about Aurane Frernis. She has offered me 100 drakes to keep my mouth shut about this. 55 Finishes quest I have agreed to keep Belan's secret. For a modest fee. 56 I've told Belan I will have no part in her lies. 60 Finishes quest Aurane Frernis was glad to know who was responsible for the false claims that were being made about her. She rewarded me with 100 drakes.